These were delicious! I feel like I say that all the time. But really, I wouldn't post it if I didn't think it was good now would I? I loved changing things up and doing lettuce wraps for dinner. I absolutely love the lettuce wraps at PF Chang's, I mean I really don't think there are many other things in this wold that are better. I even eat them knowing they have mushrooms in them and I don't even like to look at mushrooms. OK, back to this recipe, it is mushroom free, but I bet you could add some if you really wanted to! I chose to add some water chestnuts, because I think they are so good. 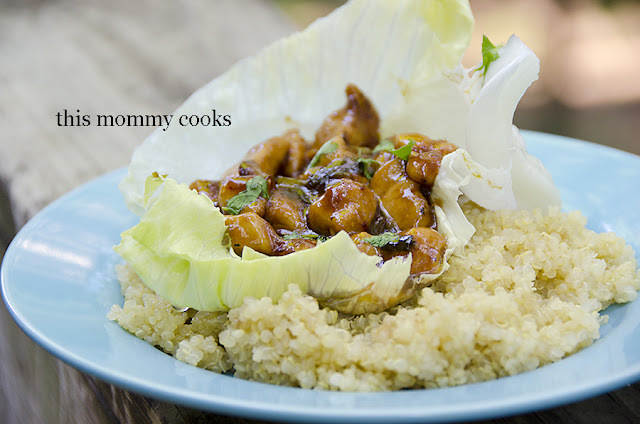 I love the crunch they add to certain dishes, especially lettuce wraps. If you don't like them, omit them, add some nuts. That's what is great about lettuce wraps, you can put anything in some lettuce! Enjoy! In a medium saucepan, mix all the glaze ingredients together, except the cornstarch, and bring to a slow boil. Take 1/3 cup of sauce and put in a small bowl. Mix with the cornstarch and whisk together. Add back into the sauce and simmer until it thickens to desired consistency, about 5 minutes. If it gets too thick, you can thin with a little water. Set aside. Season the diced chicken with pepper. Heat a large non-stick skillet over medium high heat and add the Sesame oil. Saute the onion and garlic for a few minutes until onions begin to soften. Add the chicken and continue cooking until chicken is cooked through, about 5-7 minutes. Stir in the red pepper flakes, if using, cook another minute. Pour the Teriyaki sauce into the skillet with the chicken. Add the lime juice, green onions, and water chestnuts. Spoon about 1/2 cup of the mixture into a lettuce leaf and top with fresh cilantro. I served mine over quinoa. Now you've got my mouth watering! These sound so fresh and a perfect recipe for these hot Summer days!